This mountain is the highest peak between the rest of the Aoraki/Mt Cook region and the Kaikoura Range. Its size and location allows it to be seen from as far as Ashburton. Those intending to climb Mt D’Archiac and/or neighbouring peaks or planning to cross Separation Col into the Godley region will need to use the Havelock Valley for access. Terra Nova Pass can also be used to access the Godley from the Havelock. Four wheel drive vehicle access beyond Erewhon Station, at the head of the Rangitata River system, and some way up the Havelock, is possible, but access is dependent on the state of the rivers. For those on foot, cross the Clyde River after Erewhon Station and follow the north bank of the Havelock River to Freezing Point. Cross the Havelock River and continue to Mistake Flats Hut at the confluence of the Forbes and Havelock Rivers. This is an eight bunk DoC hut (~800m, grid ref: BX17 133 868) and is situated at the back of the flats near the beech forest. From Mistake Flats Hut to Separation Col allow 6-8hrs. A direct line up the centre of the south face. Four 60m pitches of steep climbing on a narrow ice flow connect the base of the south face to the upper snowfields. The snowfields are linked by a series of ice steps to top out on the summit (4-6 pitches or simul climbing). Reach the East Ridge from the upper South Forbes Glacier, either at Revelation Col or higher (which cuts out the lower part of the ridge). Alternatively, approach the ridge by traversing The Onlooker. A major couloir at the head of the South Forbes, known as The Motorway, offers another variation to the upper reaches of the East Ridge, but is often cut off mid and late season. High on the East Ridge, where a snow crest abuts the mountain, either traverse up and right on good rock, or traverse left to the upper reaches of The Motorway. Both lead to the rock and snow of the summit ridge. An alternative, in good snow conditions, is to take a rising traverse from Revelation Col across the north-east face on to the north ridge. At the junction of the Godley and Dennistoun Glaciers ascend the broad based north ridge and a northern snow slope that follows. From here climb to the junction of two rock spurs that border either side of the northern snow slope. Ascend either a rocky couloir or a spur to the east. Traverse along good rock on the narrow north ridge. A large tower can be turned on the east. An interesting rock climb. Neville Johnson, H J Newberry, Ian Powell, Dec 1934. The North Face was skiied by Mark Seddon and Kane Henderson in 1999. From Godley Hut follow the Godley Glacier to Marjorie Falls. Then climb scree slopes north-east of the falls to the Trident Glacier. Snow slopes then lead to the rocky West Ridge. Climb this, enjoying steep and interesting climbing to the summit. From Godley Hut travel up the FitzGerald Stream to join the West Ridge at about 2100m. To avoid a steep pitch on the ridge - cross the ridge onto the northern side and traverse the upper slopes of the Trident Glacier. Continue as for Trident Glacier Route. 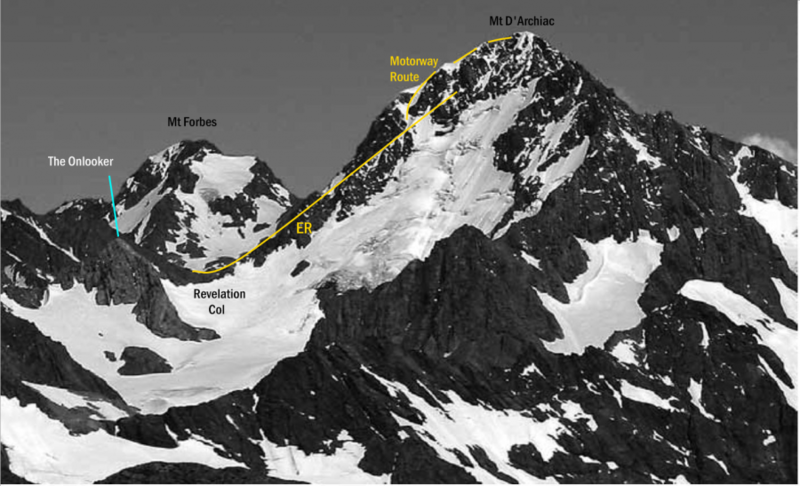 Climb up the FitzGerald Glacier to about 2400m and gain the ridge. The ridge up to the junction with the north-west ridge involves some steep snow and the occasional section of poor rock punctuated with gendarmes. The Bandaid route climbed on the central buttress, starting beside an outcrop on the right side of the buttress that offers protection from falling ice. From here move up a left trending corner groove (crux 15) for a pitch of very sustained rock climbing. Continue up and left to gain the crest of a central rib. Follow the rib to the summit. (McLeod's crampon was held together by elastoplast tape). This classic 600m ridge can be climbed from either Separation Col or from the Forbes side. The ridge includes three rock steps the first of which can be turned on the eastern side. The latter two buttresses present more difficult climbing. Above the buttresses the climbing on the ridge becomes more straightforward and beyond the intersection with the East Ridge it usually entails a snow ridge (possibly corniced). In late summer the ridge may involve easy rock scrambling. The easiest descent is via the East Ridge (via a snow couloir first then down the ridge to Revelation Col). You're a good man Nick. You're a good man Nick. Thanks for keeping me in the loop. Hopefully from the updated route description you can figure out where to put those dotted lines. Thanks Nick, i don't see it yet though. The route description and the grade needs to be changed to what I already posted, and the route marking on the pic in the Palman guide needs to be altered to follow the line that I described. Hi Peter, I've updated the route description and grade for the Bandaid route as per your post. The pic hasn't been uploaded yet. The Bandaid route is marked incorrectly on the photo. That major right hand snow gully as shown would be the easiest line but it is exposed to falling ice. The Bandaid route climbed on the central buttress, starting beside a block on the right side of the buttress that offers protection from falling ice. From here move up a left trending corner groove (crux 15) for a pitch of very sustained rock climbing. Continue up and left to gain the crest of a central rib. Follow the rib to the summit. (McLeod's crampon was held together by elastoplast tape). Oh and our climb was a 4, not a 4- at all. Peter, I have added the Bandaid Route as per the guidebook. Feel free to modify.